Ladies, you are invited to our first annual Women’s Retreat at Cohutta Springs Retreat Center! The retreat will start Thursday night, January 31st, and will run through lunch on Saturday, February 2nd. 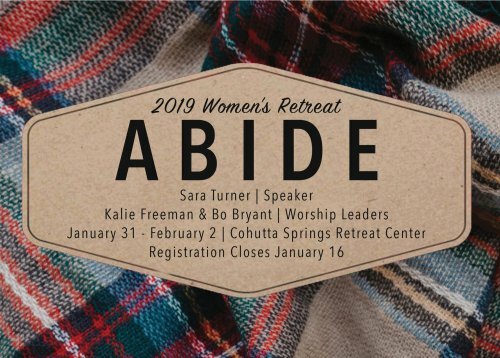 We are excited to have Kalie Freeman and Bo Bryant lead us in worship, and to hear from Sara Turner of RiveryCity Church on abiding in Christ. Cost is $200 until December 31st, and will increase to $225 afterwards. Registration can be found below and will close on January 16th!